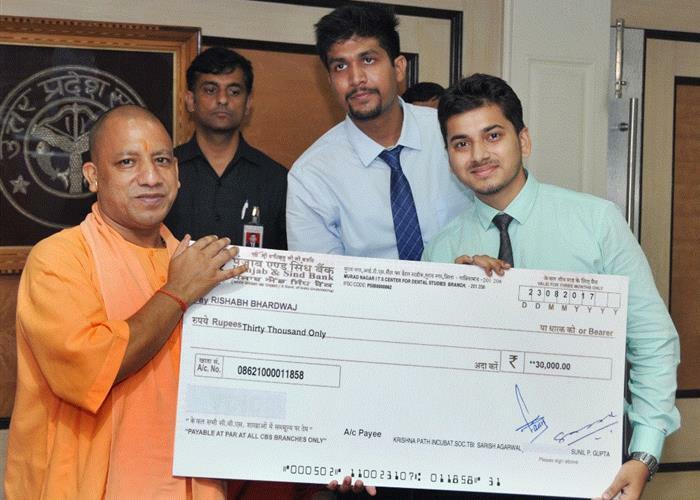 Uttar Pradesh Chief Minister Yogi Adityanath on 30th August launched the Nidhi EIR (National Initiative for Developing and Harnessing Innovations in Residence) in Lucknow and have away cheques to 11 beneficiary students. Under this scheme, 11 students of front-ranking engineering colleges were selected whose ideas were very unique. Also present were Minister of state for Food and Civil Supplies and TBI-Kite chairman Mr Atul Garg. It may be pointed out here that under the Nidhi-IER scheme, these youngsters will be given Rs. 20,000-Rs. 30,000 per month as fellowship till the next year. After this, as per their entitlement, they can also be provided seed support money (Collateral Free loan) so that they can successfully execute and run their start ups and financially strengthen themselves which in turn will provide economic impetus to the nation. Among the projects of these students was Go Glass aimed at preventing the accidents caused by sleep of drivers of roads and trains, Energy Efficient Economical Motor Bike, Sensor Based Smart Waste Management System, Hybrid Electrical Bicycles for preventing pollution, IOT technology based system to monitor glitches in solar plants, automated cleaning system of solar panels without use of water, security and safety with use of artificial intelligence and making of software and hardware for identification of face and getting the benefits of items used by consumers to them.